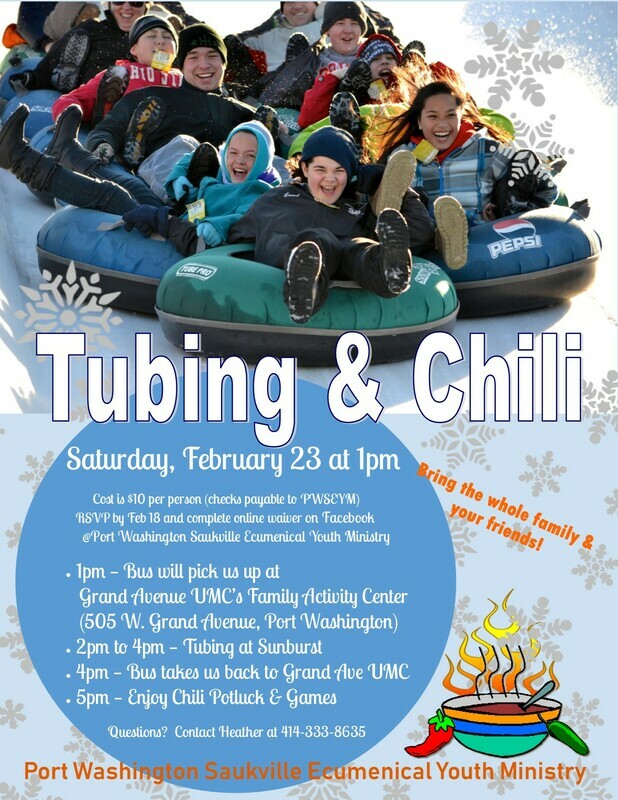 Join us February 23rd for a fun day of tubing at Sunburst and chili dinner at the Youth Center. We have arranged to have a bus for transportation. The bus is planning on leaving from the Youth Center located at Grand Avenue UMC in Port Washington (located at 505 W. Grand Ave) at 1:00pm. Tubing will be at Sunburst from 2pm to 4pm. We will be serving chili at the youth center as soon as the bus returns from Sunburst. Everyone is invited including parents and siblings. Feel free to invite a friend. Port Washington Saukville Ecumenical Youth Ministry (PWSEYM) is helping with the cost so it’ll only be $10 per person. Checks can be made payable to PWSEYM. We will require a waiver to be signed so parents, if you’re not planning on attending, please sign the waiver before you leave and send it with your youth. Print the waiver here. ​All are welcome, so invite your family and your friends! Questions? Contact Heather at 414-333-8635 ​. HELP US ADVERTISE, CLICK THIS BUTTON TO PRINT THE FLYER!